No-shows are the worst. They’re a drain on your time and your bottom line. 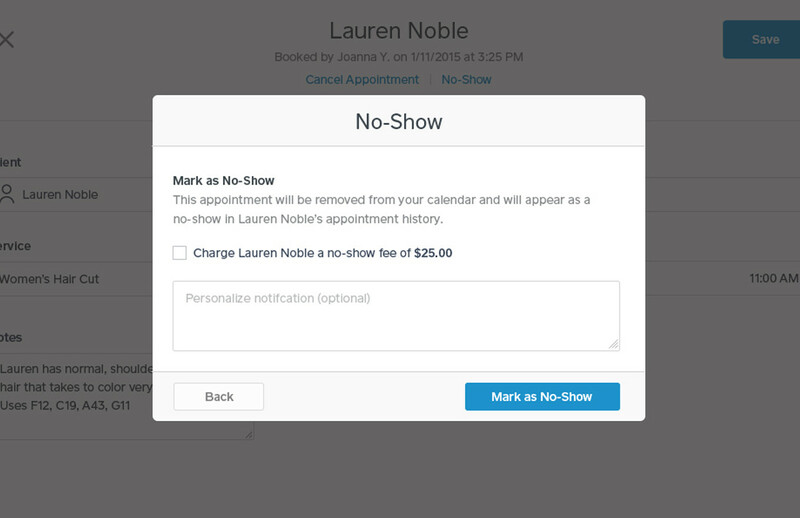 So to ensure that you have as few missed appointments as possible, we’ve added No-Show Protection to Square Appointments. When you log in to Square Appointments, you now have the option to require clients to enter their credit card information when they book. You can also elect to apply a fee if someone misses the appointment or cancels at the last minute. Businesses using Square Appointments have found that merely instituting a policy reduces no-shows. The simple act of entering card information is often enough to keep customers from missing their appointment. To set up No-Show Protection, head to the Business tab on your Appointments dashboard and select Cancellation Policy from the sidebar menu on the left. 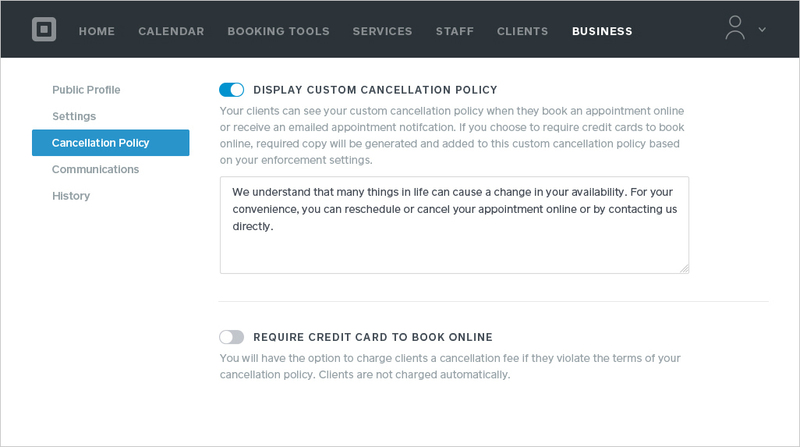 From there, enter your custom cancellation message to describe your policy in plain terms. You also have the option to require credit cards from clients booking online, and you’re in control of when you choose to apply it. With Square Appointments, your customers can give you permission to store their credit card on file and make their checkout experience even more seamless. This also lets you apply a fee to late cancellations or no shows. Payments is integrated into the Square Appointment app, so you can manage everything from one place. You can select whether you want to charge a flat fee or a percentage of the service, and can indicate what the cutoff is for late cancellation. 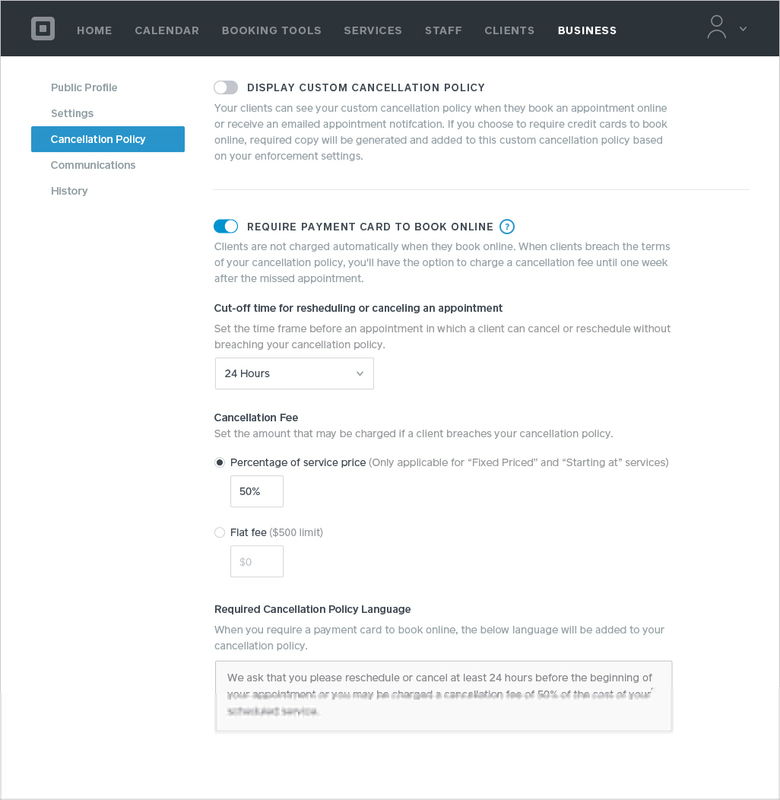 Square Appointments generates a written description that outlines your policy and combines it with your custom messaging to send to clients. To access your enforcement option, remove the missed appointment from your calendar by clicking Cancel Appointment. If this occurs within your cutoff window, the appointment is marked as a late cancellation and you’re prompted with the option to enforce your fee. Likewise, if you remove the appointment after its start time, you’re prompted to mark it as a no-show. Things always happen — flus, cancelled flights. That’s why you’ll always have control over when your fee is applied. Plus, you’ll have up till a week after the appointment to decide if and when you want to apply a late fee. Start optimizing your time and eliminating missed appointments today! *Square Appointments is rated one of the most popular, user-friendly, and affordable software products for salons by Capterra.